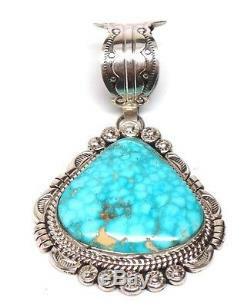 This is a Navajo handmade Beautiful Turquoise Sterling Silver Pendant! Measure 2-3/4" tall from bail by 1-1/4" wide. The item "Navajo Sterling Silver Turquoise Pendant Mary Ann Spencer" is in sale since Friday, March 24, 2017. This item is in the category "Jewelry & Watches\Ethnic, Regional & Tribal\Native American\Earrings". 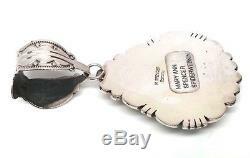 The seller is "turquoiseland" and is located in Gallup, New Mexico. This item can be shipped to United States, Canada, United Kingdom, Denmark, Romania, Slovakia, Bulgaria, Czech republic, Finland, Hungary, Latvia, Lithuania, Malta, Estonia, Australia, Greece, Portugal, Cyprus, Slovenia, Japan, China, Sweden, South Korea, Indonesia, Taiwan, Thailand, Belgium, France, Hong Kong, Ireland, Netherlands, Poland, Spain, Italy, Germany, Austria, Russian federation, Israel, Mexico, New Zealand, Philippines, Singapore, Norway, Saudi arabia, United arab emirates, Qatar, Kuwait, Bahrain, Croatia, Malaysia, Brazil, Chile, Colombia, Costa rica.